The holiday season is filled with countless ways to feel the warmth of giving. 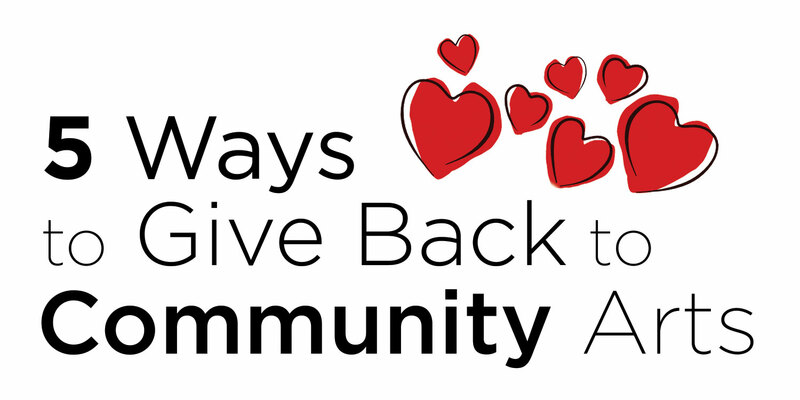 One of the most gratifying ways to feel good in 2019 is by giving back to your community. At VIBE, every day we are lucky enough to witness how community arts impacts thousands of lives across Ontario. The source of this impact is not far away – it comes from the generosity and support of people like you. Not everyone can be a philanthropist or afford to hand over fistfuls of their hard-earned cash – especially during the holidays. That’s why we’re sharing a few simple ways that you can give back to community arts – through small gestures that have BIG impacts. Find some local street art and show some love to your community. Toronto is full of amazing murals. Some are easy to spot, but others require some exploring. Put aside some time this holiday to find a mural in your neighbourhood. Even if you’ve passed by it before, this time really take a look at it. You might discover ways that the mural represents surrounding communities. Many of our city’s murals require a community consultation before they go up. Next time you spot a flyer for a community consultation in your neighbourhood, take part! Mural artists are hungry for inspiration and love to hear the community’s opinions and feelings before they turn it into a legacy. Send cards. Yes, we know. It’s an old tradition, but you can find custom cards created by local emerging artists all over Toronto! Don’t have time to look? We’ve got you covered. When you give back to VIBE, you can also take care of your seasonal cards. Head to our donation page to donate and in return, receive a set of 10 cards designed by a VIBE Artist. Don’t have the time or energy to post them? No problem. We’ll customize, address and send your cards for you. Plus, there’s an added bonus: you’ll receive a charitable tax receipt for your donation. Apply to join a Board of Directors. Not-for-Profits and Charities are always looking for talent to help grow and support their organizations. A multitude of talent is needed to strengthen every board. If you have a bit of time to volunteer and want to share your expertise, apply to be part of a board for an organization you love! Love VIBE? Apply here! Check out a new artist. Did you know that Toronto has the highest concentration of artists in Canada? Many of these artists don’t get the exposure they deserve due to the systemic barriers they face. Try to find a new artist whose work you like and show them some love by seeing their show, buying a piece or just following them on Instagram. Don’t know where to start? Check out our amazingly diverse roster of artists here. Buy gifts that give back. It’s easy to find gifts that give back to a charitable cause. Whether its shoes, chocolates or clothes, many companies are leading their businesses with a cause. NOGU is no different. This jewelry company gives 5% of all it’s sales to great charities! Check out this ladybug bracelet that supports VIBE Arts. At VIBE, we’ve learned that everyone has the capacity to give. Even by reading this post and learning more about us, you are helping us continue to grow our organization’s impact. Thank you for your support and have a Happy New Year!